*** SUPER SPÉCIAL JUSQU'À ÉPUISEMENT DES STOCK *** Savage 11/111 International Trophy Hunter XP. Calibres disponibles : 7mmremmag - 270win - 308win - 30-06 - 300winmag - 7mm08 - 300wsm. 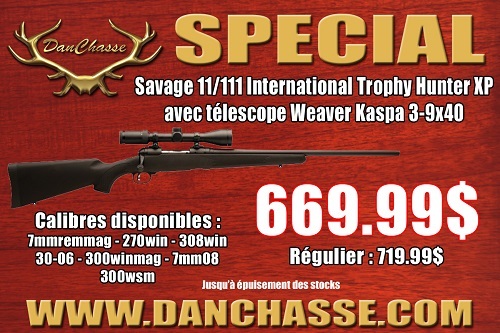 Vient avec un télescope Weaver Kaspa 3-9x40!!! PREMIER ARRIVÉ PREMIER SERVI!